Beautiful villa for sale made of a subtle blend of two ancient Indonesian houses in old teak (a joglo/a Gladak) and modern architecture in the style of the Bali tropical villas today. All furnished and decorated with great taste. The villas is all furnished and equipped. Ready to use. All the best materials of Bali are present. Old teak wood doors and windows, an infinity pool with green stone and a large iron wood deck, parquet flooring in the bedrooms and old Javanese tiles on the floor in the rest of the house. Each room has a private bathroom made of polished concrete, terrazzo, volcanic stone and a touch of ironwood (Ulin), all under a glass pergola leaving a large space for light and plantations. The kitchen in dark gray polished concrete is bounded by an iron wood bar before which is the spacious living room open to 180 degrees on the lush tropical garden. This area includes dining table, TV, lounge and a large sofa and a terrace with 4 "bean bags" Soo Santai. 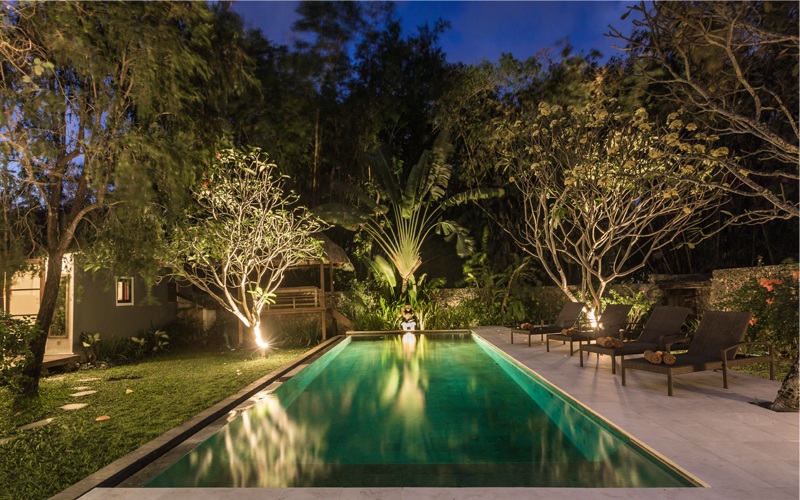 A few steps away is the Gladak which houses the 3rd bedroom in a typical Balinese atmosphere. Wherever you are in the property you get a stunning view of the rice stairs. The villa is ideally located in the heart of Umalas. Mr. Spoon, best pastry baker Bali is 500 meters, the center of Seminyak 5 minutes and the French school of Bali less than 2 minutes.